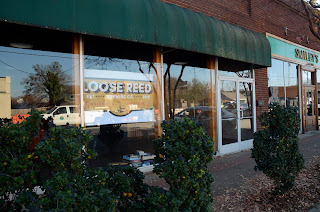 As promised, here's what I learned after a conversation/photo shoot with Tracy of Loose Reed. Although this will be the first time he's worked in a brewery (his own) it's the culmination of over 10 years of home brewing. Add that to the years that his parents were home-brewing and one can understand why he says he's been involved with beer brewing most of his life. Moving on from his very first brewing experience, a hoppy brown ale from a 21st birthday present kit, which he describes as "ok" but it quickly led him to try more sophisticated recipes, even moving on from extracts to all grains. I was able to sample one of his creations, Grapefruit Napoleon Complex, a berliner weisse with grapefruit added, at this year's Greenville Craft Beer Festival at Fluor Field. I enjoyed it so much, I went back for samples three times! His Gingah the Ninja Pale (with ginger) was already gone before I could taste it but I'm certain I would have liked it. Obviously, many folks did. What's in store for his new location (the former Growler Station)? His plans include a 2 bbl brew house with 4 bbl fermenters and serving tanks, a larger seating area, a new bar, outdoor patio and very fresh beers from the tanks. I asked him about his initial beer choices for brewing. He told me that the "beers will be mostly English and German ales with experimental variations." Sounds good to me. He also assured me (an unabashed hop head) that an American IPA will certainly be included in the mix. I'll drink to that! Looking at the "hot side" brew house location. Cooler space will not be an issue. Good space for sipping in the sun. Probably a concrete patio is in the future. I'm anticipating that by mid-Summer (maybe sooner) I'll have the pleasant problem of deciding which neighborhood nano-brewery to I want to try; Loose Reed or Upstate Craft Beer, which is just up the street on Augusta. I know, the life of a beer-blogger can be tough, filled with decisions and writing deadlines(ha!).... but it's important work and someone has to do it!! !